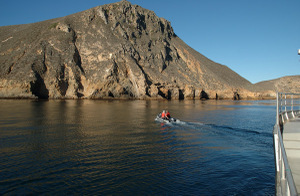 Point Bennett at San Miguel Island, westernmost point of the Channel Islands. It's hard to believe that it was this flat out there; it is very exposed and often stormy, usually rough and seldom diveable. These factors may explain the survival of a population of red urchins there, among the reefs just offshore. Their offspring could repopulate the rest of the Channel Islands. The California Department of Fish & Game is considering opening the area to limited abalone harvesting. We'll see what 2007 brings! 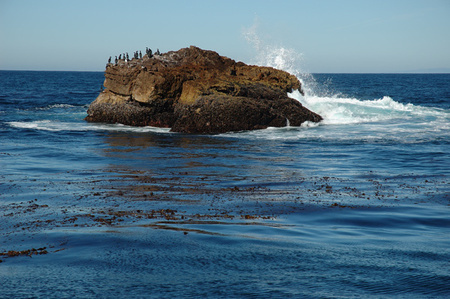 Cormorants at Can Rock, on the northeast side of San Miguel Island. This spot is near a verdant kelp bed, and must be a good fishing ground. 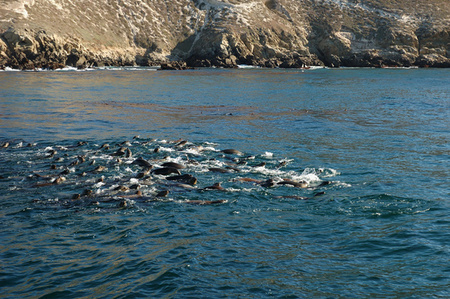 Sea lions at Adams Cove, San Miguel Island. 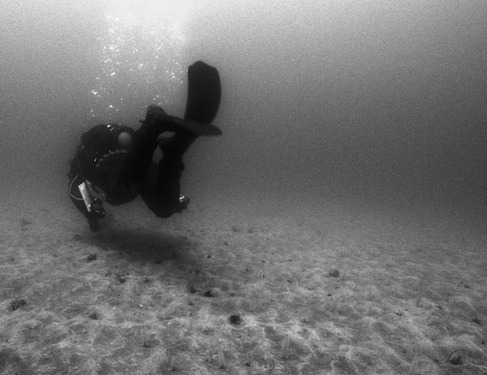 Underwater in this spot, often I saw sea lions in every direction I looked. Two blew bubbles in my face while snapping their teeth, and another shoved my elbow; but mostly they enjoyed making fun of the clumsy human. The sea lions stay together, either because they are afraid of sharks, or because they are social; or are those the same thing? San Miguel is famously inaccessible; I finally made it for the first time on my 7th attempt, on the dive boat "Conception". 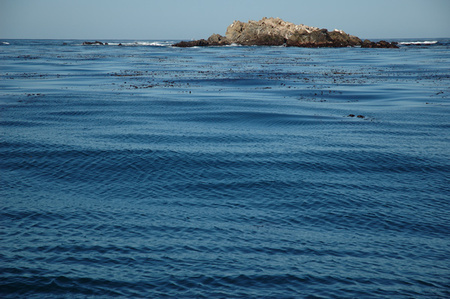 The island is close to Pt Conception, and weather and swell are changeable and often hostile. 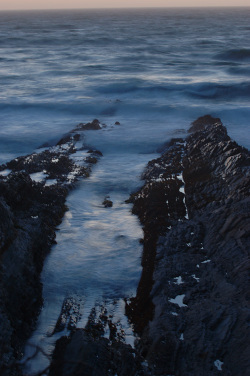 It can be lovely when one actually does get there -- at least below the surface. 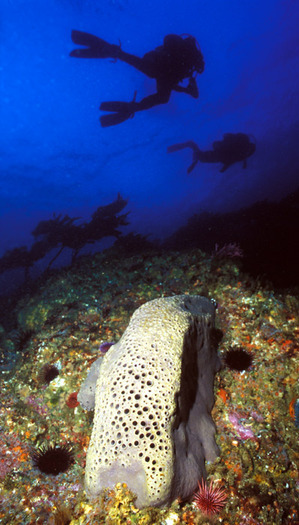 Here San Miguel shows its most friendly face, near Hare Rock on the northeast corner of the island. It is truly a desert island. 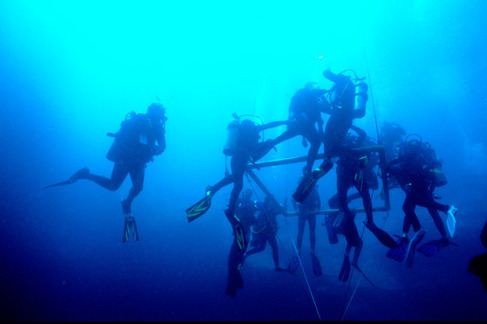 Below the surface the water is rich with kelp, fish, and abalone -- diveable only under the best conditions. 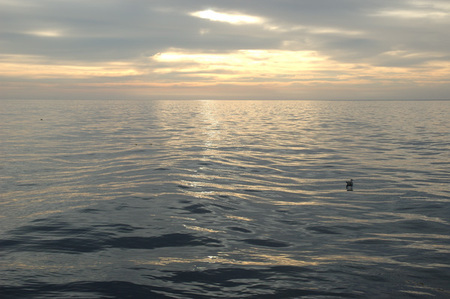 On this perfect day, a sundowner wind from the northeast onshore drove wind waves at the eastern end of the channel, but flattened the water toward the west -- or so the captain of the Shearwater explained. He has sailed most of the world's oceans, and navigated to Pacific atolls without watch or chronometer, so who am I to disagree? Particularly on such a perfect day. 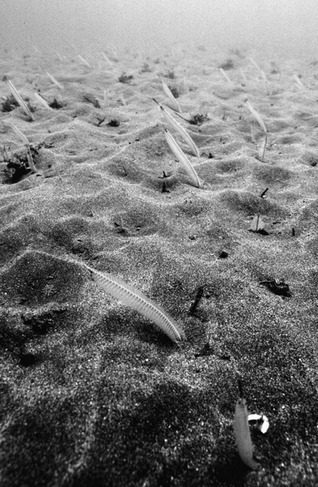 Sea pens on sand, in current, off the East side of Santa Rosa Island. The east side of the island is sheltered, but most of the bottom is sand until quite close to the rocky shore. Stiff currents can make it tough to reach the fun spots.